The Konica Minolta Di2510f is a multifunction copier that offers a few significant improvements over Konica Minolta’s previous model, the Konica Minolta Di2010f, while still maintaining its low cost approach on print and copy production. The Konica Minolta Di2510f also maintains affordability in a market where in a lot of times performance and functionality come at a high price. In such a competitive market, it’s good to know that there is still an option for small to medium sized offices and businesses that demand high performance to choose a much more inexpensive multifunction alternative. The Konica Minolta Di2510f boasts improved speeds for print and copy functions at 25 pages per minute, with a maximum of true 600 x 600 dpi that gives high quality images and graphics. It also features dual printing options, with choice of two internal printer controllers: Pi3505e PCL that allows for PCL5e and PCL6 control; Pi3505e PostScript 3 + PCL provides desktop PC control of PostScript Level 3, while providing additional functions for more complex printing tasks. The Konica Minolta Di2510f also provides trayless duplexing capabilities that should make print and copy tasks a lot easier and faster. Fax function for the Konica Minolta Di2510f is also improved. Built in capabilities include Super G3 fax for high transmission speeds and reception up to 33.6 Kbps, plus an optional internet fax function for a much more improved fax distribution. Added features for its fax function include the optional dual line capability, improved memory capacity, autodialing locations, broadcasting transmissions, F-code support, and for security purpose a confidential mailbox transmission/reception, not to mention other features for speedy faxing input and output. 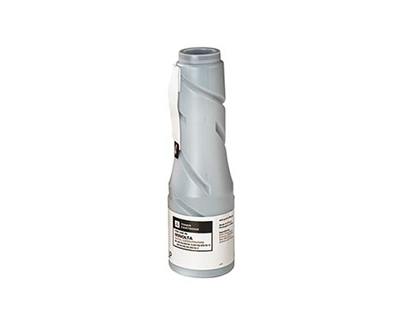 For its optional scan function, the Konica Minolta Di2510f offers the SU-2 Network Scan Kit for high speed scans, scan to e-mail, URL, FTP in PDF or TIFF formats. It also enables the machine for hard drive scanning to enable document distribution in digital form with much ease. For scanning documents directly to a desktop PC, the Konica Minolta Di2510f adds SU-3 internet fax and network scan kit for enabling internet and IP scanning. Scan resolution stands at a maximum of 70 scans per minute, quite competitive for an optional function in this multifunction machine. Other features include an optional automatic document feeder with a maximum capacity of 80 sheets and a multi-bypass tray with a 150-sheet capacity. Output capacity stands at a maximum of 1,200 sheets. There are also finishing modes such as sorting, stapling, mailbin sorting, punching and crease sorting, which should allow for a faster and more flexible task-handling. 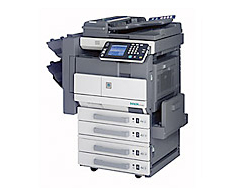 Other optional features such as cost accounting and device management are available for the Konica Minolta Di2510f. These features require additional plug in services and software such as PageScope Netcare, Netview and Microsoft Management Console. Warm up time for the Konica Minolta Di2510f is also quite impressive, needing only 17 seconds approximately to be ready for production. Another nifty feature for the Konica Minolta Di2510f is worth mentioning, which is its tilting panel display system. This proves to be quite advantageous especially for easy viewing, whether one is seated or standing up. This also makes the Konica Minolta Di2510f quite versatile in its placement in the office; no need to have the Konica Minolta Di2510f be moved around, especially if the machine is situated on an oft-sunlit space in the workplace. Another nice addition in the panel menu system are the conclave buttons, making operation a lot easier even for handicapped users. One of the caveats from the Konica Minolta Di2510f is its image resolution, which only stands at a maximum of 600 dpi. Comparing this to other multifunction printers, the Konica Minolta Di2510f provides only half of the resolution others offer, albeit at a higher price range. Also, the Konica Minolta Di2510f output capacity can use a much needed improvement. Its maximum output capacity of 1,200 sheets doesn’t exactly mean high-volume production, especially when stacked against other machines that have capacities of 3,000 sheets and up. Some of these multifunction printers are also inexpensive like the Konica Minolta Di2510f, which clearly does not help its marketability in terms of production capacity. Also, its dimensions for a low capacity printer/copier is relatively bulky, measuring 26–3/4" x 28" x 28–1/4" (WDH) and weighing 163 lbs., again quite heavy for a multifunction device. Review it: "Konica Minolta Di2510f "
The Konica Minolta Di2510f comes in with a 14,000-sheet toner cartridge that produces monochrome prints and copies. 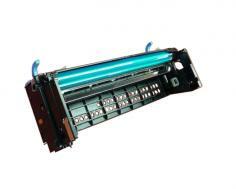 Its page yield is based on a 5% coverage, with its drum unit having a 100,000 life cycle before replacements are made. With these specifications, recommendations for monthy duty cycle for the Konica Minolta Di2510f should be around 500-3000 sheets, in order to maximize usage for both ink toner cartridge and drum unit.